Denmark-based Widex, one of the world's largest manufacturers of hearing aids, has a passion for innovative architecture. Their CO2-neutral headquarters near Copenhagen has received international attention for its design and environmentally friendly technologies. When it came time to fit-out a building to serve as its U.S. headquarters, Widex asked JRS to fuse a commitment to design excellence with a budget conscious approach. JRS worked on several test fit scenarios leading to the selection of the current location, a former industrial showroom. Seeing potential in the three-story structure, their team provided design solutions for an energy-efficient 21st Century headquarters. 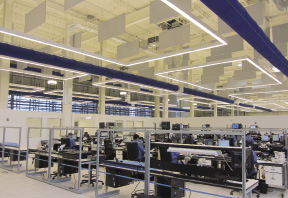 To human-scale, the 35 ft. high production area exposed ceilings were retained for their open aesthetic while floating rectangular lights achieve the effect of a suspended ceiling,without the cost. To maximize air dispersion, fabric duct sock technology was an alternative to costly metal ductwork. AC and heating are controlled by motorized dampers: In the winter the system draws in warm air at the ceiling circulating it to the floor level; in the summer cooler air from the floor level is returned. The building is additionally equipped with motorized window blinds that open and close in relation to the sun, reducing added heat gain. Work flow was a major factor in the layout of departments and adjacencies. JRS also planned for visitors with a windowed interior walkway allowing views of the manufacturing process on the first floor. A circular light fixture suspended in the main hallway serves as a direction finder in the large facility. Consolidating operations from four area locations, the new headquarters is testimony to our team's ability communicate creatively with an overseas client.